TreeGuy wrote: I'm on the fence regarding pro-life/pro-choice. Peterson was wrong about the law and he was taking an overly broad interpretation, which would never stand up in court. TreeGuy wrote: And the young entitled leftists that LOVE handouts sure LOVE using the FREE services and food from these non-profit organizations or as you call them "non-tax paying entities". What services and handouts from "non-profit organizations" are "young entitled leftists" in particular, recipients of? When I was young and in youth groups that did camping related activities, I went all around town selling popcorn and chocolate bars to pay for it. The churches can continue to do this, or use their donation money etc. But there’s no way I want the government giving churches money so that they can spend it on Pre-Life signage and harassment. An in regards to the first page comment where someone mentioned legislating ideas. That would violate the separation of church and state. This is not a violation of it. The government has its charter. And it’s free to provide funding at its own discretion to groups regardless of their religious affiliation, so long as they respect the laws of the land. If groups want to campaign against the freedoms this land has bestowed upon us, that is their right, but they don’t get to expect government handouts. Last edited by Omnitheo on Feb 9th, 2018, 6:09 pm, edited 1 time in total. This is yet another case of our current government enacting bad policy for feelings not facts. Should The government be funding anti-abortion activities? NO. Should the be funding pro-abortion activities? NO. What was actually being funded? A summer program or something else? Was this even looked at....of course not, this is about feelings and optics and knee jerk parliament choice.....based against a specific faith in Canada. That is where the problem happens. This was badly implemented, and even more poorly conceived. A far smarter route would be to create a application that has an evaluation of the organizations overall activities and if government funding is appropriate. Then you draw up a comprehensive list that applies to Canadian across the board as to what funding from this government sector can be used for. As it is right now, our PM has enacted a plan that focuses and excludes people mainly based on faith, not the appropriate actual use of funds. They should have created a system that applies to Canadians, not specific Canadians. I can say for a fact I went to a Christian summer camp for a number of years as a kid and never did I head a damned thing about abortion ever, it was never a message, and never was anyone made to sign a form professing to make sure they never mentioned it either. Who can even enforce such a thing either? The concept I can understand, what has been done however is just another poor plan that will accomplish one thing, creating bigger rifts between the people in this country who could have otherwise agreed. Verum wrote: What services and handouts from "non-profit organizations" are "young entitled leftists" in particular, recipients of? There are shelters, food banks, soup kitchens, detox and other programs ran by faith based "non-profit organizations". People, it seems especially the left, love to complain about the "church" and say how they should not be tax exempt but they don't mind using their services. These organizations can afford to run these programs because of the people that freely give to them and the tax exemptions they receive. This is why it was a bad move to create a faith based exclusion policy, instead of a policy that would allow the government to direct funding to acceptable vs not acceptable activities. I think most people could agree on the yes vs no activities, but they used a broad brush and targeted Christianity, or at least something that was easily seen as such. For anyone who cares, here is Scheer’s take on it. Hurtlander wrote: I think it’s wonderful that ALL religions now must sign an agreement that they won’t promote any sort of belief or doctrine that violates the charter of rights and freedoms, before they can be eligible to apply for government grant money. Having an opinion against abortion or any other matter is not against the Charter of Rights and Freedoms. The Charter's purpose is to keep governments from suppressing citizens' right to voice their opinion. You're suggesting that it's the opposite, and that government should have the right to stifle people's right to express their opinion. Perhaps you weren't aware of that before you made your post. One could ask why government would give public money to people whose religious beliefs are that females should undergo genital mutilation, or that females not be allowed to go to school or vote. Yet Trudeau gives our money to those people quite regularly. One has to be careful not to cross the line of blatant hypocrisy. Gone_Fishin wrote: One could ask why government would give public money to people whose religious beliefs are that females should undergo genital mutilation, or that females not be allowed to go to school or vote. Yet Trudeau gives our money to those people quite regularly. As did Stephen Harper. Perhaps you weren't aware of that before you made your post. Gone_Fishin wrote: Having an opinion against abortion or any other matter is not against the Charter of Rights and Freedoms. The Charter's purpose is to keep governments from suppressing citizens' right to voice their opinion. You're suggesting that it's the opposite, and that government should have the right to stifle people's right to express their opinion. Perhaps you weren't aware of that before you made your post. Where the did I say people aren’t allowed to have their own opinions or beliefs ? As long as those opinions and beliefs if acted upon don’t violate our laws, all is fine..
What I don’t support are groups, including ANY and ALL religions that continue to suppress human rights, receiving government grants, or receiving any sort of government money’s..
Ka-El wrote: As did Stephen Harper. Perhaps you weren't aware of that before you made your post. The difference would be Harper didn't make rules that target specific religions and beliefs for personal reasons. This was a garbage easy route that will have larger repercussions because "feeling nice" is more popular than being an actual leader. What they needed to do was adjust the application process to cover a great amount of funding across the spectrum and change where and how such funding could be used, not make a rule against Christians, and let's be honest, that's what this was. I find this interesting. I have never heard any "young entitled leftist" who were recipients of services from religious run shelters, food banks, soup kitchens, etc. complain about these organisations being tax exempt. In fact, while I have heard complaints about churches being specifically tax exempt, it's not particularly from the left alone, and often from people on the libertarian, etc. end of things. Being anti-religious doesn't make one left-wing. Being entitled is not specifically a left or right wing thing, but either side can frame the other as behaving in such a manner with little difficulty. Personally, I am rather glad that these organisations run some of the charitable works they do. It is a terrible indictment of our province and country that charitable groups are providing the lowest level safety nets that the government should be. If nothing else, it leaves people who rely on such services in a precarious situation if the services close due to lack of funding or charitable support. I think it's all too easy to view those whose life circumstances are similar to our own as having similar political and social opinions, unless we are informed otherwise. Similarly, it is easy to view those whose circumstances are very different as having opposing opinions, if no other significant amount of information is provided to the contrary, and I feel that you have fallen into such a trap. Just because one is in a position in life to rely on shelters, food banks, etc. doesn't mean one is leftwing, liberal, etc. Similarly, just because one is financially successful, with a well looked after home and a respected career doesn't mean one is not a socialist. How’s is the government singling out one group? All groups need to follow the charter. Hurtlander wrote: Where the did I say people aren’t allowed to have their own opinions or beliefs ? You said in your post that promoting certain religious beliefs would be against the Charter. Hurtlander wrote: Where the did I say people aren’t allowed to have their own opinions or beliefs ? As long as those opinions and beliefs if acted upon don’t violate our laws, all is fine.. Odd that you support EVERYTHING Trudeau, then, Trudeau who decided it was wise to remove sections from our citizenship guide explaining that FGM is illegal here. This, even as he was warned that practitioners of FGM were being brought into Canada in increasing numbers to do the deed, points to his "support" of female rights only when it suits him politically, yet he's receiving support from the enlightened left on it. Things aren't lining up very well, even when you cuss about it in your posts for added dramatic flair. Gone_Fishin wrote: You said in your post that promoting certain religious beliefs would be against the Charter. Can you pinpoint exactly where I said that, it certainly isn’t in the quote you posted..I was very clearly ONLY discussing the criteria to collect grant money. Really, when was that ? 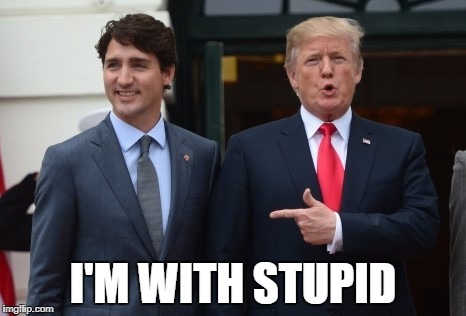 Can you show where I’ve supported Trudeau more than perhaps once ?